As a writer, it is my opinion that how authors view the film adaptation of their own work is irrelevant and inconsequential to the quality of the adaptation itself. For example, whether Stephen King appreciates Stanley Kubrick’s The Shining fundamentally does not make it a lesser film. 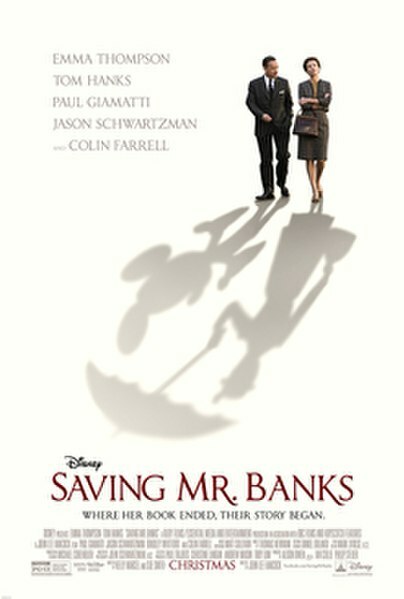 This is the central question presented in John Lee Hancock’s Saving Mr. Banks. The story recounts Author P.L. Travers (Mary Poppins), writer of Mary Poppins, reluctantly meeting with Walt Disney (Tom Hanks), who seeks to adapt her book for the big screen. As they are collaborating on the film adaptation, Travers reflects on her childhood growing up in Australia with her father (Colin Farrell), revealing her own personal attachments to the Mary Poppins story. Emma Thompson breathes a great inner life into P.L. Travers, humanizing a role that is greatly restrained and otherwise very unlikable. Tom Hanks, combining his star persona and natural ease, gives us a living and breathing Walt Disney. Hanks makes everything look so easy. Colin Farrell turns an affecting performance as Travers’ chronic alcoholic father Travers Goff, and also props to Annie Rose Buckley as the young P.L. Travers. The heart of the story lies in the flashback segments, as we see P.L. Travers’ past with his father in Australia and it shows that P.L. Travers essentially wrote Mary Poppins as wish fulfillment. Director John Lee Hancock balances the material perfectly. Even though I fundamentally disagree with Travers’ persnickety demand of complete faithfulness, I empathize deeply with why she was so overprotective of her own material. It makes for much of the laughs as we watch the gloom Travers single-handedly killing all the child-like enthusiasm of the staff at Disney. It is probably best to see Mary Poppins first to get a more wholesome experience, as seeing the numerous classic scenes and songs that Travers could have prevented from ever being created gives a whole other level of tension. Also, stay for the credits for a surprise easter egg. Despite probably being overshadowed in terms of awards recognition, Saving Mr. Banks is a very enjoyable experience. Audience will find laughs and tears, as it is a well-made feel good movie.